I’ve read Crystal and Company for about a year, so I’m tickled to be here guest posting today as she is one of my favorites! As a mom of a busy family, I’m always looking for quick, healthy recipes. I like to eat food in season, and I like to buy organics. To try and save money I buy food in bulk. I also use lots of organic coupons! Getting dinner on the table during the school year is a challenge. I have two girls that play volleyball, and sometimes we don’t get home until after 8. If I didn’t have a crockpot, I’m sure we’d be swinging by the closest fast food joint in a fit of hunger! But having a quick and easy meal doesn’t start just with a crockpot. By planning ahead and using one cooking day a month to freeze meals that can just be defrosted over night then dumped in the crockpot the next day, dinner becomes really quick and easy. This recipe is easy to make ahead and freeze in the marinade. Don’t you just love a no-brainer when it comes to the question, “What’s for dinner?” In fact, I love any meal that I can do all the prep work first, freeze it, then make it in a hurry. I’ve got freezer recipes for Four Grain Waffles, Whole Wheat Pancake Mix, and Twice-baked Potatoes that can all be prepped ahead! Combine sesame oil, preserves, rice vinegar, garlic, ginger, Sirachi (if using), and soy sauce. 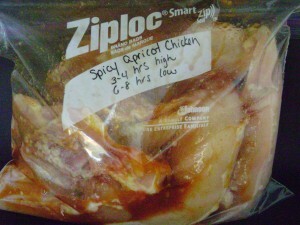 Place chicken in freezer safe bag and cover with marinade. The night before cooking, place chicken in fridge to defrost overnight. The next day, place all ingredients in crockpot. Cook on low for 6-8 hours or high for 3-4 hours. So tell me, do you use a crockpot? Andrea strives to live the frugal, green lifestyle. In addition to her quick, healthy recipes she loves to find a deal on organic products and hunts down all the organic and natural food coupons she can! She also shares her tips for going green! I’m always looking for some great recipes and lately, I keep trying to find some good crock pot ones. It really does make cooking easy when you can “fix it and forget it” 😀 I’d probably have to leave off the hot sauce, since mine don’t like spicy things, but it definitely sounds interesting! I made this last week and it was very, very tasty! Thanks for the invite, Emily. Hey! Just stopping by to let you know I featured this at Savory Sunday this week!! Exciting. Thank you so much! 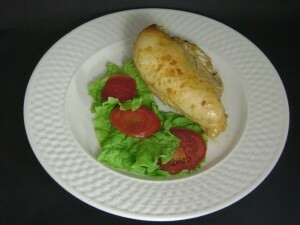 I would like to make this with frozen boneless chicken breast, what would you suggest for a cooking time? One thing I really wish these sites would do is post the Nutrictional information on the recipes they post. As some of us are having to watch cholesterol, sodium and calories. It doesn’t help if you just say its healthy as I have seen recipes listed under healthy that had over 2000mg sodium. Beverly- wouldn’t much of the nutritional information be based on the brands and ingredients you choose to purchase? For example, you can choose low sodium, sugar-free, low carb, etc., for so many products. This will directly affect your nutritional outcome. Since I do not have formal nutrition certification or background, I am very hesitant to share any nutritional information and present it as facts knowing someone’s life or health depends on it. Additionally, knowing the specific brands the consumer chooses at the store to create the recipe will also affect the end result as well. If someone has a diet that is sensitive to sodium, sugars, etc., I imagine they are privy to applications and tools available that will allow them to covert the nutritional facts based on the brands and ingredients they have purchased. Not to mention, any recipe can be taken to be made healthier or less healthy simply by the choices they make when purchasing the ingredients at the grocery store. This specific recipe was shared by one of my contributors who focuses on finding affordable organic and eco-friendly products on a budget. She prides herself in helping hundreds of families save on the frugal, green lifestyle. While I trust that any recipe she would promote as healthy would in fact be healthy, I am certain someone could take that same recipe and pack it with unhealthy choices that defeats the purpose. Also, if you have an application or website that you use for nutritional conversions, I would love for you to share it here in the comments for other readers to use as a resource as well.